Qualcomm has released a promo video for its latest generation processors in which the chipmaker openly mocks one of its main rivals, MediaTek. MediaTek recently announced that it’s working on the world’s first true octa-core CPU and Qualcomm is keen to prove that this is a wrong move. 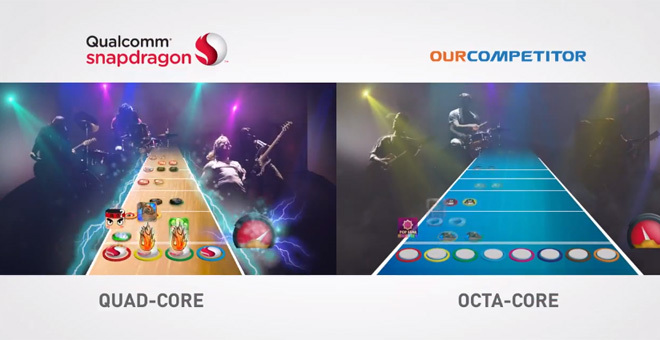 The San Diego based chip manufacturer manages to show the difference between its Snapdragon line of processors against the competition in a pretty amusing Guitar Hero styled way. According to Qualcomm, the number of CPU cores doesn’t really matter, as 17 of the top 20 app in China use two CPU cores at most. And even the rest barely needed the power of the third and fourth cores, Qualcomm says. This ultimately makes the struggle to pack more and more cores into a CPU redundant. The chipmaker states that it’s not the number of cores that matter, but their performance. As a result packing more of the old cores isn’t better than less of the new. It’d be really interesting if MediaTek decided to pick up the gauntlet and respond to the attacks of its main competitor.